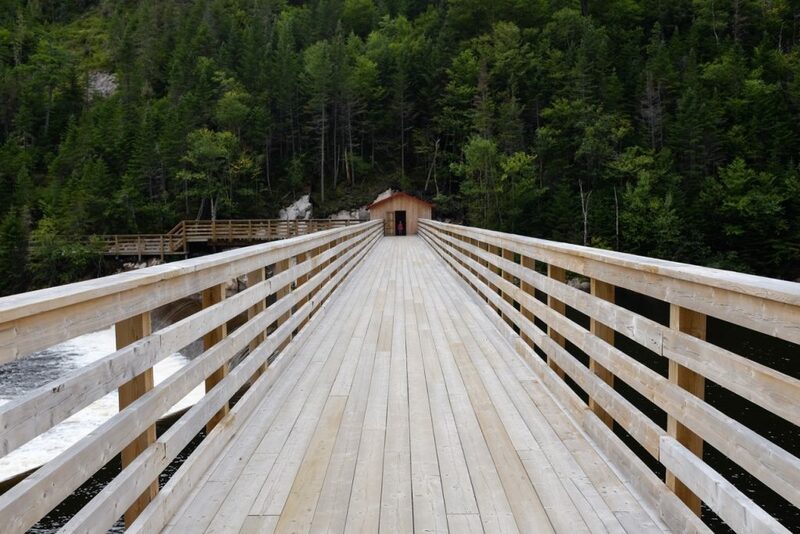 While Gilded Age ancestors chose historic fishing camps along Quebec’s sparkling inland rivers, today’s Murray Bay summer residents often head to the nearby Hautes-Gorges National Park for their outdoor adventures. 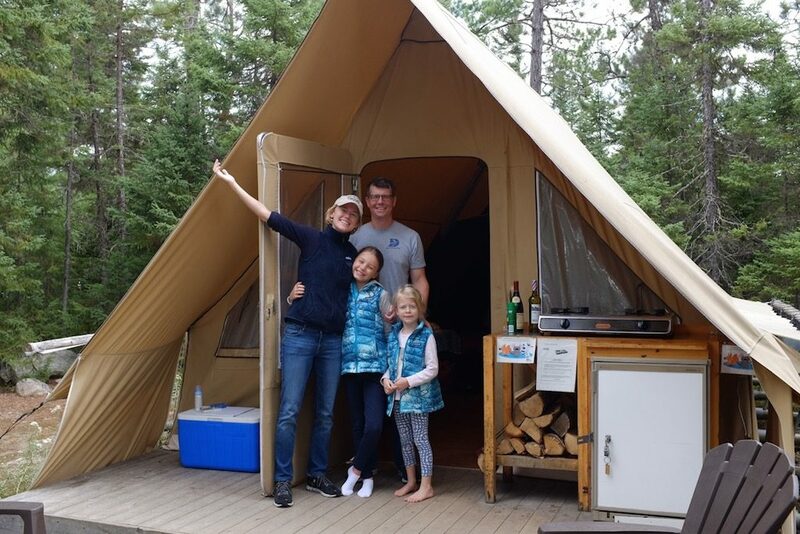 From hiking superb trails along the Malbaie River, which runs into the St. Lawrence, to a night in a huttopia, a canvas tent on an A-frame, there is plenty of fun al fresco to be had. Dolly, Jack, Eloise, and Hilary in front of their huttopia. While occupants in both the fishing camps and huttopias would say that this isn’t glamping—and they would be absolutely correct—this spectacular camping locale nonetheless takes the ‘rough’ out of roughing it. The peaks and valleys of Hautes-Gorges. The Hautes-Gorges Park is 40 minutes from the packed social agenda of Murray Bay: cocktail parties on verandas and in the gardens of century-old villas filled where delphinium, phlox, and hydrangeas abound. Murray Bay summer residents visited this old logging site and dam for many years before the area was made a National Park in 2000. It is the centerpiece of the UNESCO Charlevoix biosphere reserve and features riverboat rides, kayaking, canoeing, and biking, as well as spectacular hiking trails, all just two hours east of Québec City. 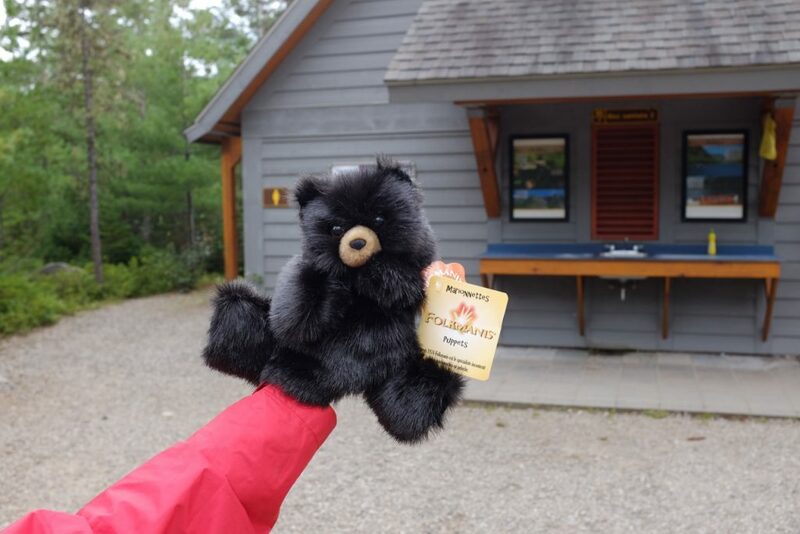 A souvenir of the park. 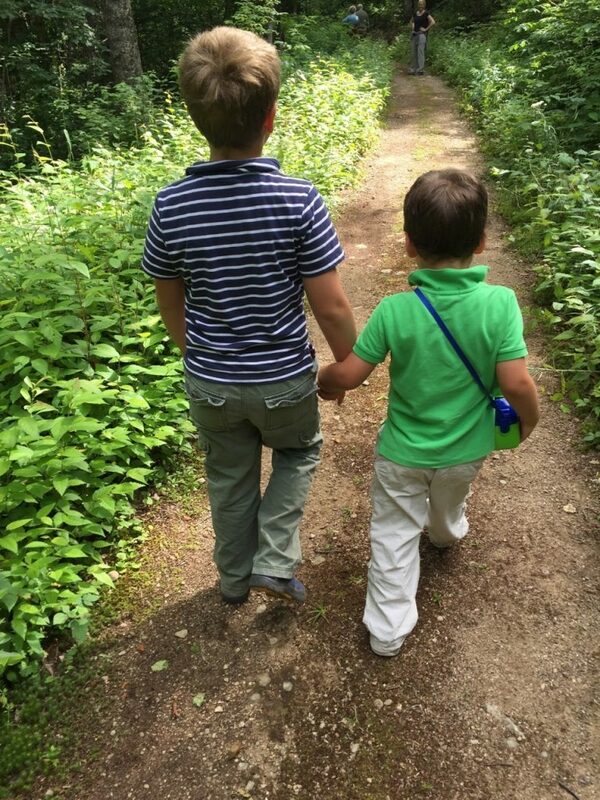 Brothers Oliver and Henry hike the trails. Priest and folklorist Felix-Antoine Savard immortalized the brave lumberjacks on the river in his 1937 novel Menaud, Maitre-Draveur. The logs they cut were converted into pulp paper at nearby mills and shipped on the St. Lawrence River at Murray Bay, also known as La Malbaie, for use by the New York Times and the Hearst Publishing Company. 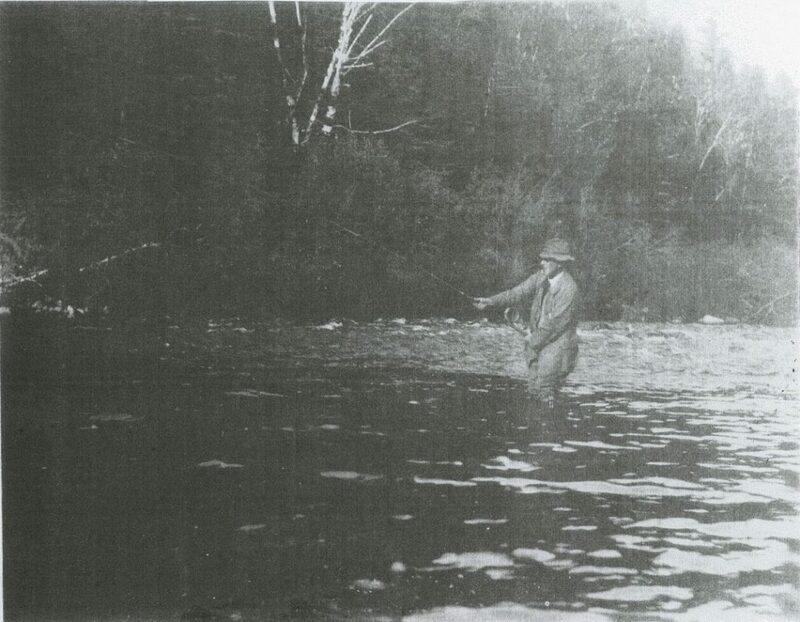 William Hume Blake fishing La Malbaie River. 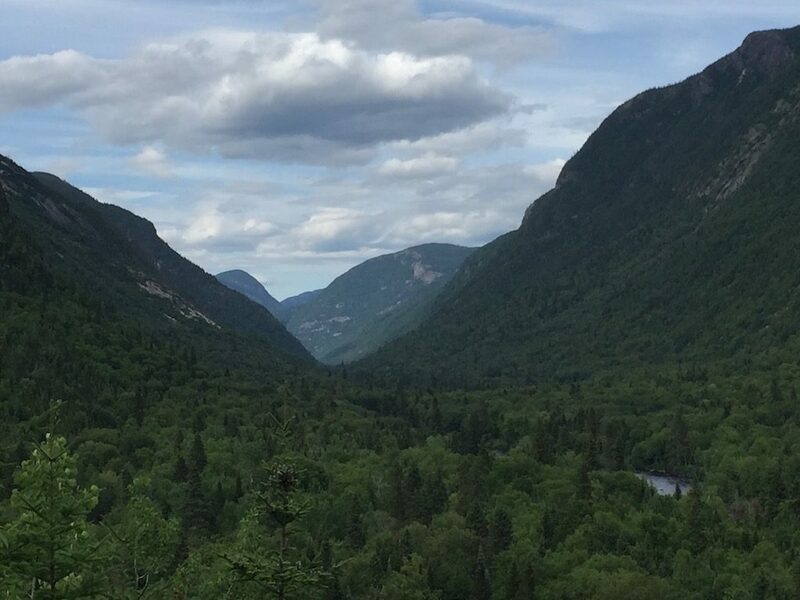 There is a mountain named for him above the river in nearby Hautes Gorges de la Riviere Malbaie National Park. 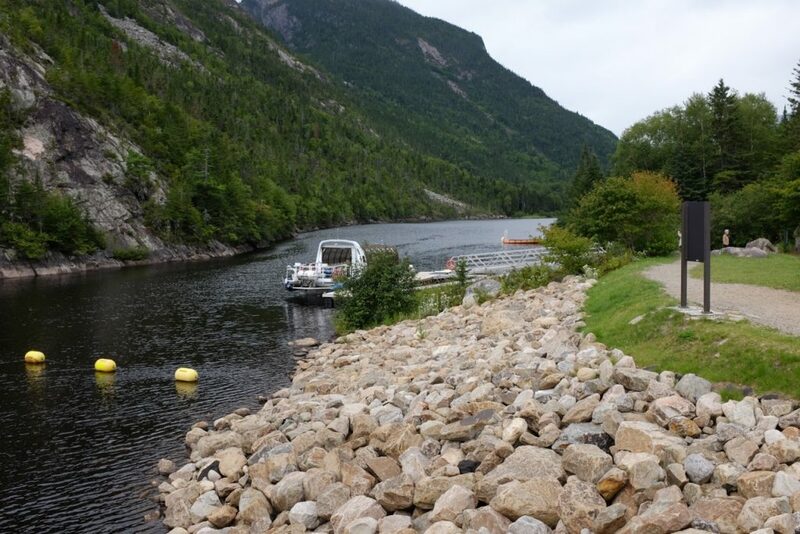 Unlike Newport’s summer residents, the Tafts, Minturns, Vanderbilts, Sedgwicks, Tiffanys, Blakes, Fishes, and others who came to Murray Bay 100 years or more ago were lovers of fishing, hiking, picnicking, and feasting on the fresh air in Charlevoix, Québec. French-speaking guides took early visitors to secret salmon- and trout-fishing lakes; on picnics, which included picking blueberries and the rare fraises des bois; and taught them French Canadian songs and dances, particularly beloved by President William Howard Taft, who first came to Murray Bay in 1891. Outdoor adventures remain summer priorities. 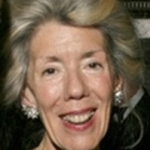 Huttopia was founded in 2005 by Celine and Philippe Bosanne in France. Today hugely popular sites can be found at Versailles—where they see as many as 800 campers daily—in the Pyrenees, and in the Loire Valley. The Bosannes met and married in Canada so finding just the right spots there was a priority. The Hautes Gorges Park features seven great trails, including the shin ache-producing but spectacular l’Acropole. At the top of this straight-up, 11-kilometer trail is a spectacular view of the Laurentians, one of the oldest mountain ranges in the world. 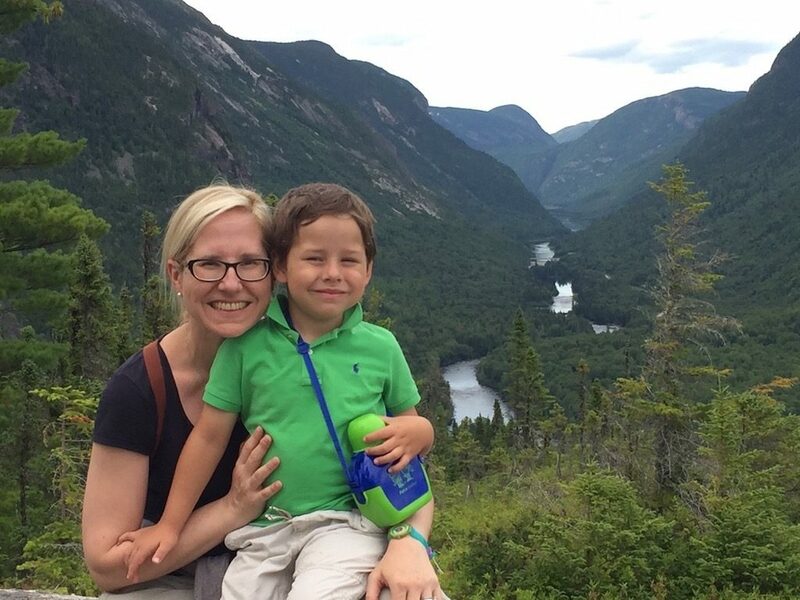 Julia and Henry pose in front of the spectacular view beyond. Bridging the waters of park. Not having to pack and pitch tents or load up portable stoves and other equipment makes the preparation for an outdoor experience more enticing for family fun. Huttopias usually hold up to six people in relative spaciousness and cost around $130 per night. They often sell out months in advance. Enjoying the fire pit and a freshly cooked meal at the table. The canvas structures set on wooden platforms are nestled in the woods at angles so you don’t see your neighbors and are not far from a large bathroom featuring showers and potable water. They are equipped with mattresses on which people put their sleeping bags, a refrigerator, dishes, pots and pans, lanterns and lights, and a small heater. 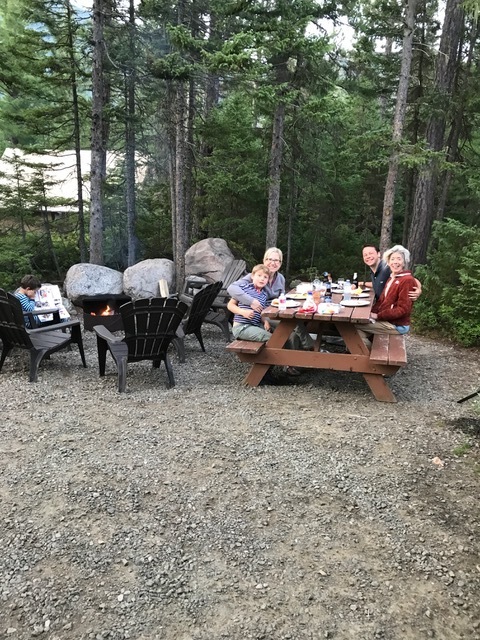 A fire pit outdoors with a picnic table nearby makes for great eating, particularly the camping staple known as s’mores. And bacon never tasted better! 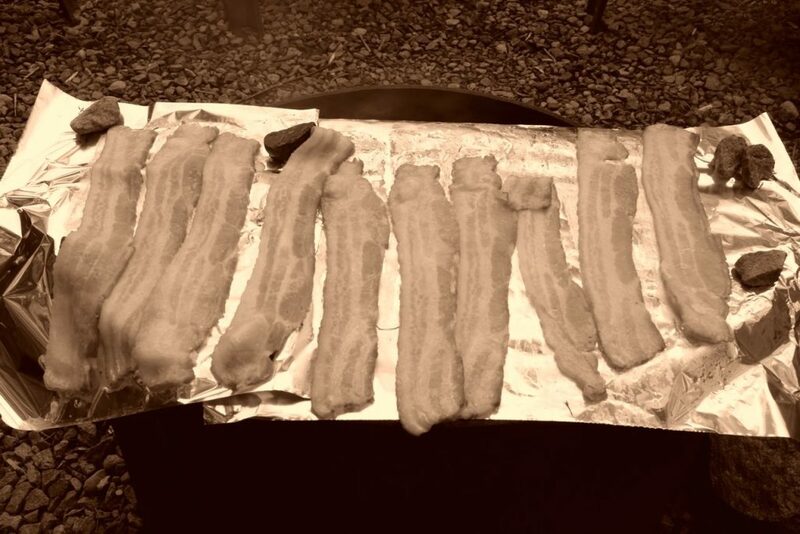 Bacon, a portrait in black and white. For more information on the park and reserving your huttopia, visit sepaq.com/pq/hgo. This entry was posted in Dispatches on August 30, 2017 by Kay Whitfield.